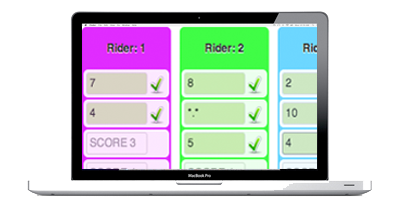 Affordable Yet Powerful Live Scoring System! Turn your local surf contest into a World Tour looking event. No more paper sheet judging! Get computer based judging panels. Judges connect their computer / mobile device to the network and they can start judging. 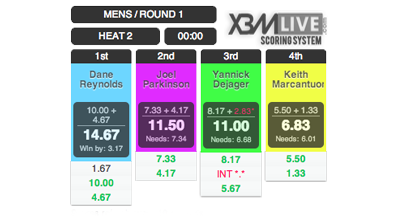 All scores are saved by a unique judge-id so everything can be tracked afterwards. It's possible to choose between 3 to 5 judges. If you have access to the internet users can follow your event LIVE online. Using the widgets it's now very easy to include the livescore box anywhere on your website! Since version 2.0 the scoring system now runs on the well known Worpdress software. Over 60 million people use Wordpress to create their websites so with the X3MLIVE Scoring System integrated it should be easier than ever to create a mindblowing event site! © X3MLIVE - Affordable yet Powerful live scoring system!